anCnoc Highland Single Malt Scotch Whisky has announced the first limited release of its 22 Years Old, the latest hand selected addition to the brand’s core range. The whisky, which has been matured in American bourbon and Spanish sherry oak casks at its Knockdhu distillery in Knock, Banffshire, has been bottled in its most natural form – neither chill-filtered nor coloured. Priced at a recommended retail price of £85, only 950 cases will be made available throughout 2013 in the UK, USA, Sweden, Russia, Denmark, Japan and Taiwan. 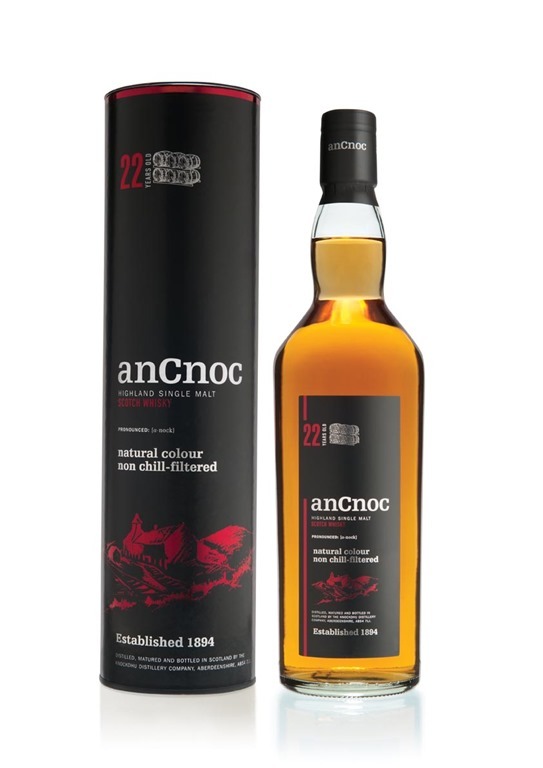 “Releasing our 22 Years Old marks the first in a series of exciting developments for anCnoc in 2013 which are sure to delight fans of our portfolio of single malts worldwide. Bright gold with a copper tint in colour, anCnoc 22 Years Old is full bodied and complex with crushed clove, raisin and blood orange flavours on the palette, the taste is closely followed by layers of fragrant vanilla and leather. As well as the release of the 22 Years Old, anCnoc has also re-released its popular 16 Years Old single malt which was unavailable for the majority of 2012. Over 800 cases will be made available this year and will be sent to key customers in the UK, USA and selected export markets. The distillery at Knockdhu has been in operation since 1894. anCnoc, which is owned by Inver House Distillers, is a brand closely associated with the arts having released a series of Limited Edition expressions last year with the designs of acclaimed Scottish artist Peter Arkle and a continuing support of the arts community.